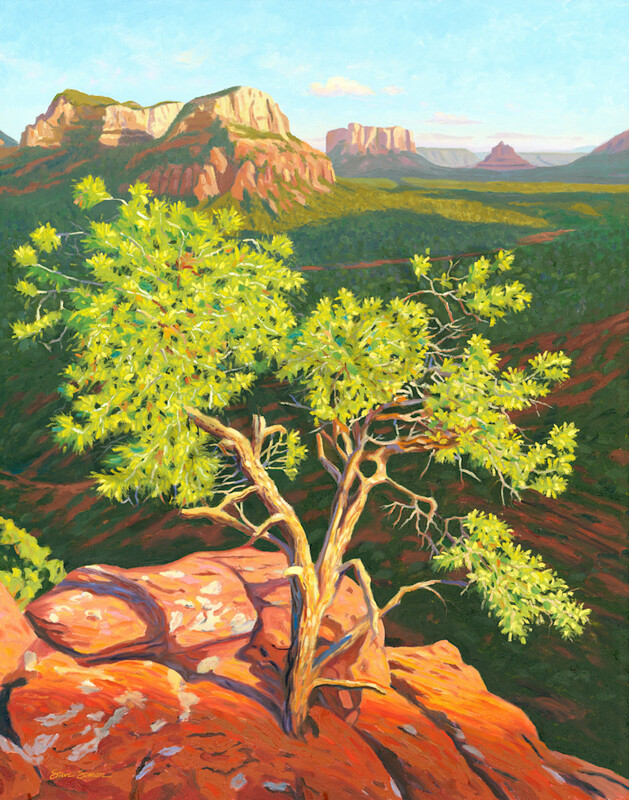 Oil painting of a pinion pine tree atop the Airport Mesa Vortex in the Red Rock Country of Sedona, Arizona. Sedona. Sedona is situated amidst the Coconino National Forest. Pinion Pine and Juniper are ubiquitous in and around Sedona. Some of the rock formations pictured here just before sunset include, from left to right: Twin Buttes, Courthouse Butte, and Bell Rock. Bell Rock and Airport Mesa are considered two of the earth's energy vortexes. Original oil painting of a pinion pine tree atop the Airport Mesa Vortex in the Red Rock Country of Sedona, Arizona. Sedona.